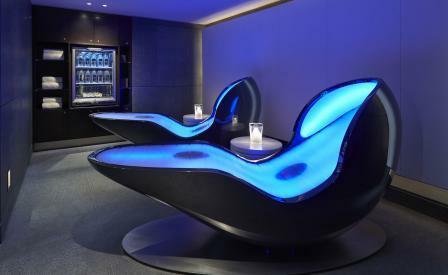 The fact it is located in Knightsbridge, around the corner from some of London’s best hotel spas, has set the bar high for the wellness offering in The Mandarin Oriental. Health and fitness has become a lifestyle for the new generation, and with the type of guests that expect their travels to blend seamlessly into their daily lives, a quick jog on an average treadmill, no longer makes the grade. Luckily though, as part of a hotel group best known for going above and beyond, it is already one step ahead. In-house lifestyle coach and trainer to the stars Ruben Tabares - who has taken top athletes including professional boxers David Haye and Amir Khan through their paces - is on hand to for anything from nutritional advice to specially devised workouts. And with Hyde Park literally on your doorstep as well as a state-of-the-art gym with a new 17-metre indoor pool, there really is no excuse not to keep up your fitness routine. Post workout pampering can be had in the serenity of the two-floor spa; unwind in the Sanarium - a classic sauna combined with humidity - before yielding to the skilful hands of one of the therapists. We suggest indulging in the detoxification ritual, which includes a caviar salt scrub, lymphatic drainage massage, detoxifying body wrap and an express facial. Finally, a wholesome breakfast of poached eggs, served with avocado and bee pollen, should have you sufficiently fuelled for a visa-burning spin through Harrods and Harvey Nichols, located just opposite the hotel.